The Composer lens is very similar to a tilt shift lens, but not nearly as costly as the tilt shift lens. It is also able to do quite a bit more creatively than the tilt shift lens. Photographers are able to tilt the lens to a certain position and use the manual focus ring to be sure the subject is in direct focus. Most photographers who use this lens, love to have a creative and unique side to their work, that would otherwise not be there without the use of this lens. It is the perfect addition to a photographer’s collection of lenses, and a must have for a serious photographer or even a serious amateur. There is a brand new feature to the Composer called the Optic Swap System. The Optic Swap System allows the photographer to change the glass inside the lens casing, giving the photographer even more creative options with their photographs. 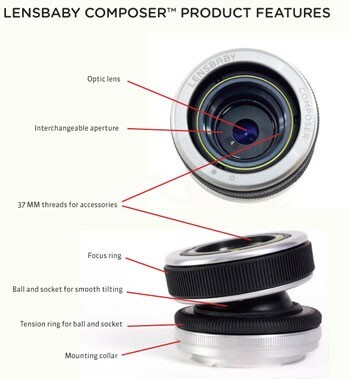 The Lensbaby Composer comes with the single glass Optic, the Plastic Optic and a Pinhole, Zone Plate Optic. The creative possibilities with this lens are endless. The Composer lens can be purchased individually as just the lens or as a set with everything included. To the typical wedding photographer, this Composer lens kit is a must have for those romantic, creative shots. Because this is a manual lens, the focusing on a subject is not completed automatically, so it is difficult to use at first, until the photographer is familiar with its limitations. It is a great lens, however, for use beyond wedding photography. Nature photography is perfect with this lens, the photographer just needs to keep in mind what they are trying to focus on, and what subject they would like blurred in the background. It adds that special touch to a particular photograph, making it extremely unique. The reviews on the Composer are great. Most photographers who have trouble with their creative side of photography say that it is a great tool in creating the perfect creative shot, that they otherwise would not have been able to get. It forces the photographer to stop and think about the subject they are shooting and what would look good in a blurry state. Another option that photographers like about the Composer is that it comes with five different lenses, if the entire kit is purchased. That is like five different images in the same picture. Imagine the beauty of a nature photo using all the creative effects possible. It is definitely not a boring, typical lens. Many serious amateurs also like to use this lens to see what type of effects they can get on particular photographs. It is a great lens to use when photographing children, animals, or any type of still subject. It definitely adds that special touch to a photo, making people stop and look a second time at the photograph. It is not a typical lens to use, but a very creative lens to capture a special look. Typically, when using the Lensbaby Composer, the subject will need to be still and not moving. The lens can be very challenging when trying to shoot moving objects or spontaneous photos,causing it to be more difficult to use in those situations. The Composer does not have the ability to zoom in on a subject like other lenses. The settings are just right, however, if photographing a non moving subject, such as a portrait or still object. The Composer does require the photographer to move the flexible lens manually to focus in on a subject. The lens itself does not have to be held in place, it is quite good at doing that itself, once in the right spot. When adjusting the lens, however, it is somewhat difficult to apply just the right pressure so as not to miss the mark. Once the photographer is used to the limitations of the lens, however, it is quite simple to use. One of many of the effects of the Composer is the ability to blur subjects that are in the same field as other subjects that are being shot, giving it that special unique look. The lens focuses nicely on the subject at hand and will give a sense of moving to the subjects that the photographer chooses to blur. The Composer is a very light and compact lens. This is a great option for the photographer, in that it is easily carried along with other lenses. Many photographers like to carry it for that special creative photo that would otherwise be missed.